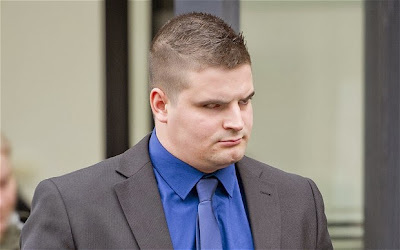 Lance Corporal Liam Culverhouse is facing jail after he admitted killing his 19-month-old daughter. He managed to escaped with his life by playing dead while the gunman stood over him. However, he lost his right eye in the incident. He was flown back to the UK for treatment and took part in a Channel 4 Cutting Edge documentary about the mass shooting called The Air Hospital in which he gave a graphic account of what took place. But just 18 months after returning home Culverhouse launched an assault on his daughter Khloe Abrams, who was then just seven weeks old. She was taken to hospital following the attack, in May 2011, which took place at the family home in Northampton, but never recovered and eventually died in a children's hospice in November last year. Culverhouse, of Kingsthorpe, Northampton, pleaded guilty to causing or allowing her death. After the case, a spokesman for Northamptonshire Police said: "Khloe Abrams died at the Rainbow Children's Hospice in Loughborough on 7 November 2012. She was 19 months old. Khloe died as a result of a severe trauma following an assault which took place in May 2011 when she was seven weeks old."